Are you thinking about traveling, studying, or working in Portugal or Brazil, but you don’t know any Portuguese? Want to improve your conversation skills with the Portuguese-speaking people in your life? 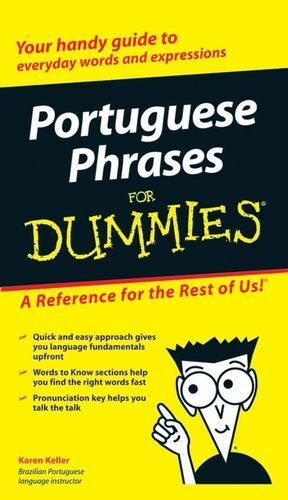 Portuguese Phrases for Dummies is the perfect diving board for anyone looking to communicate and even become fluent in the language. Phrases and particles to make you sound like a local! Knowing these fundamentals, you’ll be able to communicate with Portuguese-speaking people and continue learning about the language and culture. With hundred of useful phrases at your fingertips, Portuguese Phrases for Dummies will give you a basic comprehension of this beautiful language and have you speaking instantly! Karen Keller is a journalist who lived and worked in São Paulo, Brazil, for three years. Before moving to Brazil, the California native taught Spanish at a New York City–based foreign-language-education Web site. Keller is also a published travel-guide writer. She currently lives in New Jersey, where she is a local newspaper reporter.